Parts and service spares for the Apple MacBook ranges. The MacBook brand is used for Apple's entry/consumer level laptops. From their launch in 2006 up until late 2009, the original MacBooks (listed here as Black/White) were visually similar with almost all changes being internal. A short lived identity crisis occurred with the launch of the Aluminium Unibody MacBook alongside a remaining entry level white model. On it's second incarnation, Apple re-branded the Aluminium MacBook as the 13" MacBook Pro and from hereon in, these parts are listed under the MacBook Pro section. The last original design of white MacBook was replaced late 2009 with a new white unibody range featuring a Unibody shell design similar to the MacBook Pros. After receiving an update mid-2010, they were discontinued Feb 2012. These white Unibody models are listed here under the MacBook Unibody section. 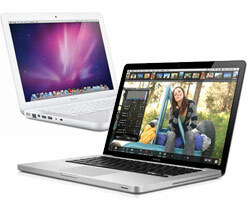 The MacBook is arguably one of Apple’s most popular products. It has experienced great success from the moment it was launched back in 2006, and continued to remain popular until it was discontinued in 2012. Having relaunched in 2015, the MacBook remains a popular laptop and is one of Apple’s best-selling products. Regardless of their current standing, even MacBooks can occasionally break. Don’t worry though as here at The Bookyard, we offer a spare parts and repair services for all Apple products. Whether you’re looking to get the device fixed by us, or are simply looking for new parts to fix it yourself, we guarantee you’ll find what you are looking for right here on our website. We offer a wide variety of spare parts for Apple products, including all incarnations of the MacBook. From the original to the aluminium unibody and current models, our range of spare parts covers it all. All of our products are of the highest quality possible, so you can rest assured knowing they will work with your device. We guarantee that the new parts will fit perfectly, provided you have purchased the correct parts for the right device. Whether it’s a small fix that you require or something much bigger, we can help get your device back into working order. Apart from selling spare Apple MacBook parts we also offer a repair service, ideal for anyone who isn’t particularly experienced in fixing laptops or simply doesn’t have the time. You can send your device to us and one of our experts will identify the issue and suggest the best possible solution. If you already know what the issue is, that’s even better. In this case, we will simply provide you with a quote and you can be on your way while we fix your device. Our team of experts have years of combined experience working with Apple, so they have extensive knowledge in a wide variety of Apple products. Here at The Bookyard, we are experts when it comes to all things Apple. As one the UK’s leading Apple spare parts specialists, we have years of experience and are here to help you get your device back into shape. Browse through our range of products today, and if you can’t find what you’re looking for, feel free to contact us and we’ll be more than happy to answer your questions.